"The sweet taste of the podium, Alex Kihurani co-driver, Seamus Burke [father and crew chief] and Joseph Burke celebrate a tough but successful rally season, with their podium finish in Maine. Photo Neil McDaid"
In this his first year contesting the national Rally America Championship, nineteen year old Joseph Burke has been awarded with the coveted “Rookie of the Year award.” Burke clinched the title by placing an impressive third overall at the New England Forest Rally in Maine, the final round of the championship. 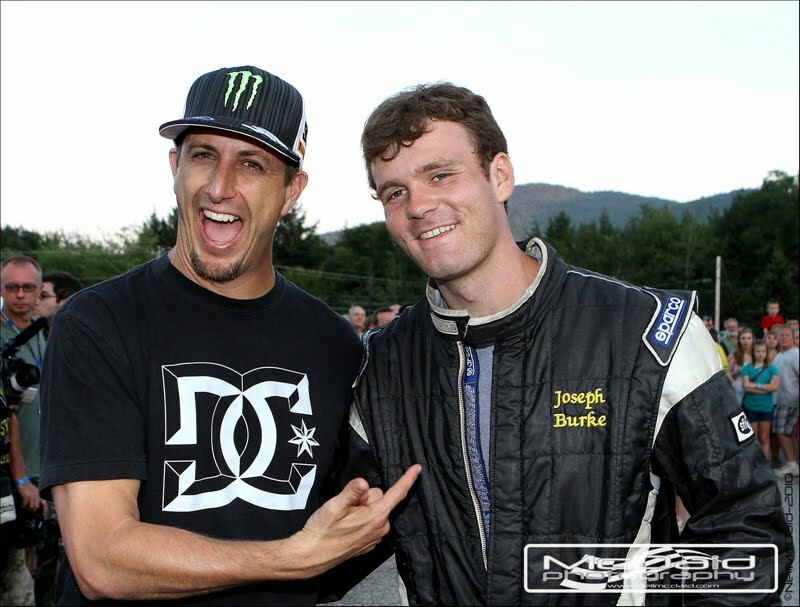 Joseph is the only son of veteran Irish rally driver Seamus Burke, who among his many motorsport achievements is a two-time United States Rally Champion. Joseph, currently a student at Auburn University majoring in mechanical engineering, already holds an impressive sporting CV. He was selected to compete at the 2005 United States Soccer Finals at Nike World Headquarters at the young age of 14. More notably, he led his high school soccer team to a state championship in 2009, as the team captain. In Burke’s short rally career he most definitely has seen his fair share of up and downs. In his first outing, which was in a 2WD Integra, Joseph managed to capture 3rd overall in class at the 2007 Maine Forest Rally. From there, Joseph went through a tough learning curve with mechanical issues and a few spectacular off-stage DNF’s. 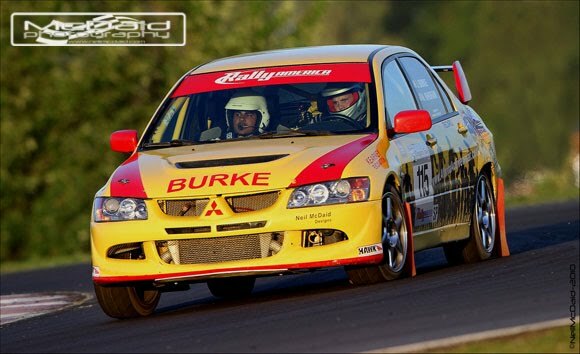 In his first outing in an AWD car, Burke would claim first overall in a Kearney Motorsport Impreza at the Black River Stages in 2008. Burke Motorsports would make the long trek west for round three, Olympus Rally, in the beautiful state of Washington. It would also be Joseph’s first outing with new co-driver Alexander Kihurani. After only 5 stages, while sitting 2nd in SP class, turbo pipe failure slowed a great run. They would eventually finish 9th overall. Heading into the penultimate round, STPR in Wellsboro, Pennsylvania, Burke was on track for yet another podium finish, but sometimes it’s not all about winning. As many have come to learn, STPR is a very challenging event with the tight tree lined stages. The slightest slip up can end your rally in a split second. Joseph and Alex would charge through the opening stages of day one, with a mostly trouble-free drive. Well, apart from displaying some two-wheeled driving skills on the super special, much to the delight of the large crowd in attendance, I might add. Burke would push hard over the last few stages at STPR to finish within the top 10 overall. 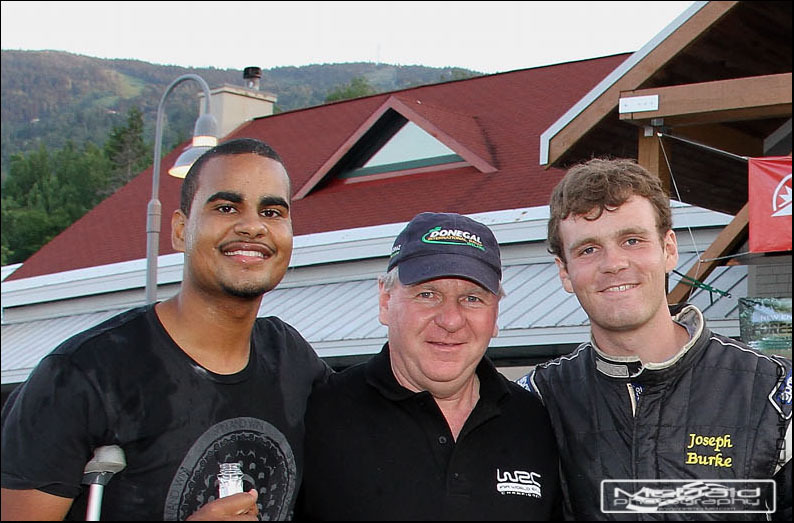 After the rally, the STPR Rally organizers awarded Joseph and Alex with the Woolf Whitaker Award for their outstanding show of sportsmanship. As we go to print it looks like Joseph will enter the first round of the Rally Cross Series at New Jersey Motorsport Park in late August. 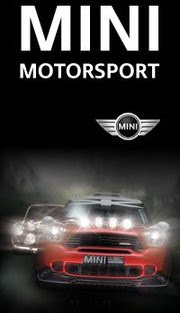 For more info check out http://www.njmotorsportspark.com/ and check out “Joseph Burke Motorsports” on Facebook.